The other day, Cris Collinsworth, color commentator for NBC Sunday Night Football, was sitting in a cramped room in his basement in Fort Thomas, Kentucky. In a light-blue Polo and slip-on shoes, he gave off the aura of a suburban dad. Collinsworth is a suburban dad. But today, as on most afternoons beginning in late summer, he’d waved goodbye to his wife, Holly, and marched past a collection of memorabilia from his playing career. Collinsworth was watching tape. If I’m not mistaken, I think they have — is that five safeties on the field? They’ve got Mathieu, Johnson. There’s Jefferson. I think Johnson’s all the way back. Yep, Johnson’s all the way back. Buchanon is right in the middle of the field. … Oh, that’s the other one, Chris Clemons. On the monitor, the five safeties backpedaled or charged at the quarterback, then retreated to their former positions. Collinsworth was rewinding the tape again and again. Here’s the problem, though. A little bit of a read blitz. I’m going to guess Clemons had Antonio Gates in coverage. Saw him block. Then Gates slips out late. And there’s nobody on planet Earth to cover him now. Collinsworth’s voice was being recorded. The resulting file — whichSunday Night Football coordinating producer Fred Gaudelli calls a “tutorial” — would serve two purposes. It would help Collinsworth prepare to call the Cardinals’ preseason game against the Raiders that weekend. It would also get distributed to key members of NBC’s Sunday Night Football crew, who would try to absorb as much as they could. Color men are usually the comic foils of NFL writers. “You’re exactly right, Joe …” — hyuck, hyuck. On his best days, Collinsworth is like the writers’ TV analogue. His perch on Sunday Night Football proves something exhilarating: That the flood of analytics and tape study and hard-headed thinking that has enriched NFL writing in recent years hasn’t gone completely ignored by TV. Just mostly. Also striking are the small but unmistakable pauses you hear on Sunday Night Football when Al Michaels finishes his play-by-play. These are instances of Collinsworth taking an extra second to stare at the field and consider what he has just seen. GEORGE GOJKOVICH/GETTY IMAGESBoomer Esiason and Cris Collinsworth with the Cincinnati Bengals in 1987. Even as a young wide receiver with the Cincinnati Bengals, Collinsworth was already thinking about ways to communicate. His head coach, Sam Wyche, noticed that Collinsworth had a tic in team meetings. A coach would explain an offensive concept or play. Collinsworth would usually understand it on the first take. But he would look around the room and spot a player with a furrowed brow. Collinsworth would ask the coach to repeat the statement, pretending that he was the one who didn’t understand. Collinsworth was the most presentable guy on just about every team he played for. In 1987, when the NFL players went on strike, quarterback Boomer Esiason became the Bengals’ spokesman. “I came off as an angry millionaire trying to fight The Man,” said Esiason. “I remember saying to Cris, ‘There’s something about you that people like. You can deliver the same message I’m trying to deliver, but they won’t be nearly as mad.’” The disctinction would later reappear in the booth: Esiason worked unhappily with Al Michaels for two seasons of Monday Night Football; Collinsworth, who is deferential to Michaels in the extreme, said he and Al are the best of pals. Even then, Collinsworth was fascinated by Howard Cosell. He onceattempted an impression in front of the old muckraker; Cosell flattered him and made him a go-to interview. But Collinsworth’s attempt to match Cosell’s dark wit turned sour. “He was doing an interview with me before a game,” Collinsworth said. “He introduced me to his wife. I did an old, standard line: ‘Well, it’s clear you married way over your head, Howard.’ I don’t know if I said it wrong, or he misinterpreted it, but he got incredibly mad.” The two men never spoke again. When Wyche cut him in 1989, Collinsworth told the press, “I don’t feel cheated.” Collinsworth had a sunny career ahead. He’d started going to law school while he was still a Bengal; if he’d used his degree, he said he would have liked to have been a tax attorney. A sitting U.S. congressman asked him to run for office. But announcing beckoned. Three weeks after he was cut, he got an offer to file features for Inside the NFL. He accepted, and later inherited Bob Trumpy’s sports radio show on Cincinnati’s WLW. Every night, that likable voice was echoing all over town. Every week, Martzke tallied analysts’ “strongest comments”; the announcers with the sharpest elbows got promoted. After a time, the criticism began to direct the art. The ’90s was the era of brawlers like Trumpy, Dan Dierdorf, and Randy Cross. Collinsworth had the reputation as a guy who made ’em mad as the enfant terrible on Inside the NFL, where he was cast opposite soothing vets like Len Dawson, and as a color man on NBC, where he landed in 1990. Collinsworth was the low analyst on the totem pole at NBC, often assigned the worst game of the week. (Once, given just six seconds to preview a Patriots-Bengals game on NFL Live, he told host Jim Lampley, “The loser gets the no. 1 draft choice. Back to you, Jim.”) He learned these were precious reps that allowed him to fail in relative anonymity. He also learned how easy it was to tweak a coach. Bill Belichick, struggling in his first go-round, with the Browns, was a frequent sparring partner. When Collinsworth was the subject of a celebrity roast, Belichick declined only because he was committed to a family vacation. It stands as a YouTube tragedy. “I always thought early on, that’s not the Cris Collinsworth I know,” said Esiason, who’s now a panelist on Showtime’s Inside the NFL. “The Cris Collinsworth I know is one of the funniest guys I’ve ever been around. But sometimes he was overly serious. In 1991, Collinsworth met a computer systems engineer named Andy Freeland, who would become his most important collaborator. A few weeks ago, I found Freeland in the new Cincinnati headquarters of Pro Football Focus, surrounded by unadorned walls. He’s a thin, friendly man who looks like he has given himself to the digital realm. His motto is, “To me, every problem looks like a computer.” Freeland convinced Collinsworth that the tools of the color analyst’s trade — back then, info from media guides and basic statistics — could be put into databases, so that Collinsworth could access them quickly. Even if Collinsworth still hadn’t yet found his onscreen persona, at least he had more digital firepower than his competitors. It’s now almost forgotten that Collinsworth replaced John Madden once before: In 2002, he became part of Fox’s no. 1 NFL team with Joe Buck and Troy Aikman. Collinsworth liked his partners but hated the three-man booth. “You hit a button to talk to the producer to tell him what you want,” he said. “At the end of the play, Troy and I would hit our button at the same time.” It was like competing in a game show to see who got to talk to America. Ebersol lured him back to NBC in 2006 when the network got Sunday Night Football. After a tryout as John Madden’s play-by-play man — “it was almost the career-ender of all career-enders” — Collinsworth took a studio job and bided his time as Madden’s heir apparent. At Super Bowl XLIII, the NBC staff threw Collinsworth a 50th birthday party. Madden was thunderstruck. “He’s like, ‘I had no idea you were 50 years old,’” Collinsworth said. It was as if the successor were going gray while Madden played out the string. Within three months, Madden had retired. Collinsworth had the most enviable job in football broadcasting, and the unenviable task of replacing a legend. ALBERTO E. RODRIGUEZ/GETTY IMAGES John Madden, Al Michaels, and Cris Collinsworth at the Academy of Television Arts & Sciences’ Hall of Fame induction in 2013. Deone Bucannon, no. 20, is a guy you’ll see down there a lot. He is effectively a linebacker. Plays so much in that slot in there. … He really is going to be a linebacker this year. He still is going to get down the field some. But they really like him in that position. Five days later, when Collinsworth called the Arizona-Oakland game, he delivered that summation nearly word-for-word during the Cardinals’ first defensive series. Collinsworth comes to the booth armed with an arsenal. Freeland wrote the Game Day app as a piece of proprietary software. Instead of the clunky, analog boards analysts have lugged into TV booths for decades, Collinsworth and Freeland can add information on Game Day right up until kickoff. During games, Collinsworth views the data on a 13-inch laptop with a touch screen. The Game Day interface shows each player, often with phonetic spellings (“DAY-own Bucannon”), with one salient fact beneath their names (“1st round dime LB”). When saying Bucannon’s name during a game, Collinsworth might glance at the screen to make sure he’s pronouncing it correctly. If Bucannon does something great, Collinsworth will touch the name to bring up additional information that he and Freeland entered. In the booth, Collinsworth also has a 28-inch touch-screen that houses a big, indexed document filled with notes that Collinsworth and Freeland have harvested from coach and player interviews conducted during the week. These notes may include longer, human-interest stories, or simply fully rendered versions of short notes in Game Day. For the Oakland-Arizona game, the document ran 38 pages. Freeland acts as Collinsworth’s spotter, but the post is largely ceremonial. He and Collinsworth almost never speak during games. Freeland will occasionally hand Collinsworth a notecard to remind him of a topic to discuss coming out of a commercial break or at the start of a drive. But when Collinsworth is on the air, the analysis is his alone. You can break down Collinsworth’s utterances into distinct types. When Collinsworth said during the Arizona-Oakland game that second-year linebacker Khalil Mack got one scholarship offer after his senior year of high school, that’s pure research — it’s probably the most repeated thing about Mack’s biography. When Collinsworth said that Raiders coach Jack Del Rio wanted to get Mack more sacks in Year 2, that came from a game-week interview. When Collinsworth said that the Raiders had two sacks in a preseason game that Mack did not get credit for, but nonetheless should get credit for, because he forced them — that is film study. The kind of film study that writers do. A few years ago, Collinsworth found himself in a weekly coach’s meeting with his old adversary Belichick. He told Belichick that one of his linemen was playing both tackle and defensive end. Belichick scoffed: The guy was only playing tackle. No, Collinsworth said, he’d seen him playing end on film. Belichick returned a while later and admitted Collinsworth was right; with Collinsworth’s command of the film established, Belichick larded him with inside dope. And the audience can appreciate X’s and O’s in those terms? I asked. At Sunday Night, Collinsworth is in his element: He has the tools to analyze football and a show that mostly rewards him for it. He hit a pothole when he started making weekly appearances on NBCSN’s Pro Football Talk show, where he got asked about teams whose film he hadn’t yet watched. “He said, ‘I don’t want to be a fraud,’” said Neil Hornsby, the founder of Pro Football Focus. “‘I don’t want to be like a lot of people standing up there talking about football teams they haven’t seen.’” So Collinsworth bought a stake in PFF, a company that grades every play of every NFL and major-college game. PFF can provide Collinsworth with a reel of every salient play that Zack Martin or Deone Bucannon participated in. Collinsworth, in turn, tried to lug the company further into the mainstream — to make it prime time. 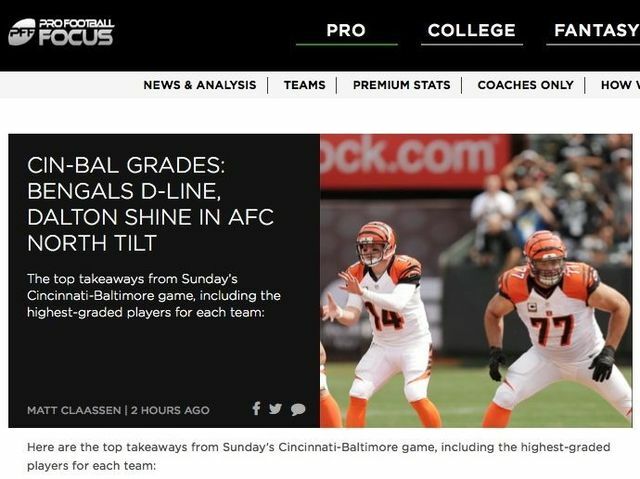 He was an advocate to move PFF from its old grading scale, which assigned players scores ranging from 2.0 to -2.0, to one that graded players from 0 to 100, which he felt was more accessible. “Now, he’s found a nice, level playing field,” Esiason said. “Funny when he wants to be, thoughtful and thought-provoking at other times.” Collinsworth has the technical undergirding that allows him to make thunderous pronouncements. It took about 25 years, but he has finally become himself. FRANK MICELOTTA/GETTY IMAGESCollinsworth, Troy Aikman, and Joe Buck at Fox’s Super Bowl XXXIX pregame show in 2005. When I prodded Collinsworth to talk about the NFL’s off-field business, his face tightened. He was being pushed onto terrain that film study couldn’t illuminate. “I hate all that stuff,” he said. “It’s such a distraction for me from what football is.” But Collinsworth knows that under Roger Goodell’s reign, it is what football is. Two events from last season dragged Collinsworth into some of the league’s biggest nightmares. The reaction from critics was apoplectic. Interestingly, it was also a reboot of the old jockocracy complaint — though this time the color man was toadying to the commissioner, not his former pals. Collinsworth said he’d talked to Goodell in August, before the release of the second video tape. Goodell was torn between severe punishment and giving Rice a second chance — an anguish that never came through in Goodell’s public statements. I told Collinsworth that people couldn’t process the idea of a truth-teller exonerating Goodell. Julian Edelman’s apparent injury during the Super Bowl ushered in a second storm. In the fourth quarter, Edelman caught a pass on third-and-long and then was walloped by Kam Chancellor. NBC cameras caught him stumbling, but Collinsworth didn’t mention it on the air. Mark Lazarus, the chairman of the NBC Sports group, saw it at the stadium and considered getting word to the announcers. Collinsworth explained that a strange televisual force had taken over: the tyranny of the replay. On the play, Edelman’s elbow and knee nearly touched the ground; it was late in the game and the call was important. Television had pulled Collinsworth into a minor dispute that was discernible on a replay, rather than a nasty subject that was unknowable. “I was looking at what the replay was going to show,” Collinsworth said. “I’m really studying it. The staggering and what came out of that, I never saw. I never saw it. Freddy didn’t see it, either. “I wish it were a discretionary thing where I chose not to say it,” he continued. “I just never saw it. I never knew it happened till I watched that game back.” The guy who sees things beyond the broadcast would have been better off watching the broadcast. FREDERICK M. BROWN/GETTY IMAGESCollinsworth and his NBC broadcast partner Al Michaels. It was getting late. Collinsworth would soon return to his “tutorial” to study the Cardinals defense. But I wanted to ask about Russell Wilson’s interception in the Super Bowl. It struck me as a classic Collinsworth problem — a piece of merry confusion that tugged an analyst toward X’s and O’s, opinionating, or both. With 1:06 left in the game, Jermaine Kearse caught the miracle heave from Wilson. NBC’s crew snapped into action. “I hit Al and Cris in the headset and said, ‘Gotta be thinking timeout,’” Gaudelli said. But Belichick didn’t call timeout, and on first down, Marshawn Lynch ran off-tackle to the 1-yard line. Wilson did something Collinsworth hadn’t anticipated: He stood up. Collinsworth’s brain whirred some more. “I thought it was a quarterback draw,” he said. “Al said that and I was like, Oh my god …” said Collinsworth. “You just knew that moment was going to live in Super Bowl history forever. I just sat there and thought for a minute.” It was a trademark Collinsworth pause, lasting about 20 seconds while Michaels cleaned up the action. “I thought, What are you going to tell people tomorrow?” Collinsworth said. What would he tell the fan in the airport lounge, or at the gas station — the fan who’d ask, “How could they do that?” Collinsworth decided this hypothetical fan wouldn’t want a football professor explaining how Brandon Browner jammed Kearse at the line of scrimmage — not right off the bat, anyway. He’d want stupor, outrage. On the air, Collinsworth began, “They tried a pick play … ” and then paused before changing course: “And I’m sorry, but I can’t believe the call. I cannot believe the call. You’ve got Marshawn Lynch in the backfield — you’ve got a guy that’s been borderline unstoppable in this part of the field … I can’t believe the call.” He didn’t convince the audience at home so much as give everybody license to immediately say the same thing. Two weeks later, at the NFL scouting combine, Collinsworth found himself at a table with Seahawks coach Pete Carroll. It was an awkward moment; Carroll had heard Collinsworth’s words replayed dozens of times. Collinsworth finally said, “Listen, I know you want to talk about this.” They repaired to another table and talked alone. It was the chance at exoneration Carroll craved. For Collinsworth is a rare creature: a television personality devoted to describing football as it is played rather than how we’ve spent the past 40 years hearing it described. Collinsworth listened to Carroll for a few minutes. “Pete, I appreciate it,” he finally said, “but I’m never going to agree with that call.” Collinsworth was absolutely sure of himself. All he had to do was look at the film. I am right 1181, is that the guy who runs this site? Andy? yea, Cris' site. Andy's the webmaster, and works with Cris on Sunday Night Football. CINCINNATI - A data-analytics firm owned by former Bengals wide receiver Cris Collinsworth is moving its global headquarters to Cincinnati, promising to create at least 39 new jobs in Over-the-Rhine. Pro Football Focus, founded in 2008 by a UK-based entrepreneur, claims to have “the most comprehensive database of NFL and college football stats on the planet,” collecting “180 unique data points on every play,” according to its website. The company received tax credits from the Ohio Tax Credit Authority on Monday and is planning to hire writers, editors, back-office workers and IT staff in the coming months, said Chief Financial Officer Kurt Freyberger. “We’re hoping for some pretty big growth,” said Freyberger, a former CFO at Cincinnati Bell who joined Pro Football Focus as a partial owner last year. Cris owns a stake, but I don't believe he's full owner. Pro Football Focus is planning to create 39 full-time positions that will create $3,128,795 in annual payroll in addition to retaining $295,000 in existing payroll in the city of Cincinnati. The website for football data and analytics that provides information for NFL and college football coaches, players and agents is planning to establish a headquarters in the city to broaden and enhance its services. The company received approval for a 45 percent, 6-year tax credit that would keep it in the area for at least nine years. The credit is estimated to be worth $247,000. he bought a stake maybe a year and a half ago? A couple of the posters here (Rich and Evan) have written some pieces for PFF, but not all of them actually got published, or I guess ended up being heavily edited (and/or stolen). Don't remember the full story.